The best choice for bathroom flooring depends on your style and budget. Tiling bathroom floors and walls is a typical treatment, but bathroom stone and slab floors can be great and make a distinct statement. Bathroom flooring can be done with vinyl, laminate or wood too. Bathroom flooring alternatives abound, limited mostly by your imagination. The best flooring for a bathroom truly depends on your imagination, tastes, and budget. Contrary to popular perception, renovating your bathroom floor need not necessarily be a costly affair. Things have changed quite a lot and today, you can have a renovated bathroom floor without burning a hole in your pocket. Choosing bathroom floors doesn’t have to be boring. There are myriad choices in bathroom flooring these days, from tile to stone to wood to vinyl, so you are sure to find the choice that makes your bathroom shine! If you are confused where to look, why not turn to the internet for help. You are sure to find numerous blogs and forums dedicated to this topic and there you can come across the latest trends and patterns available. if you are lucky, you can find pricing charts for various bathroom flooring options as well, thereby giving you a bargaining chip with the dealer. If you happen to be looking for a low cost way to make your bathroom look great without a full scale remodeling adventure, then you may want to try changing the flooring. Bathroom flooring has come a long way in the last few years. There are many different flooring options available that will work great in the bathroom and that are water resistant. Tiling bathroom floors is one of the many options. You can use peel and stick tile, ceramic bathroom tile, or stone tile to liven up your bathroom floors, to make them into the showcase that you desire. Peel and stick tile is one of the lower cost options for flooring your bathroom and is also very easy for you to install yourself. But because of the seams between the tiles, peel and stick may not be great if your bathroom gets “drowned” by kids splashing lots of water during their baths. In that case, you might consider rolled vinyl or linoleum flooring. If you are looking for a beautiful spa-like look, then you may want to consider ceramic tile or other stone tile bathroom floors. Ceramic tile bathroom floors gives that beautiful finished look to any bathroom, but be sure that the grout of ceramic bathroom floors is waterproofed. There are many different kinds of bathroom stone or slab floors from marble to slate to granite tiles. If you are looking for a way to instantly create ambiance for your bathrooms, then a tile flooring may be the way to go. If you are not held back by a tight budget, then the options are limitless for renovated bathroom flooring. Make sure you rope in an expert to build you the bathroom of your dreams. Installing wood bathroom floors is also another option. There are many laminate flooring options that work well for your bathroom flooring needs. Laminate flooring comes in many different wood grains and color choices, so you are sure to find the one that will make your bathroom look great! Laminate bathroom flooring will not warp or twist when it gets wet so it will look and hold up well in the bathroom. Just be sure to immediately dry your floor should it get wet so that the water doesn’t soak in. Laminate flooring adds character and warmth to any room and is a great bathroom wood flooring option that will be durable and will look beautiful for years and years! 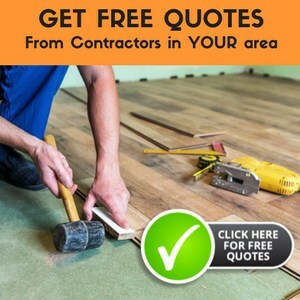 Some of these flooring options are so simple that it can be done you! however, there are a few complicated ones that you might not be able to handle and you will have to call a professional to do it for you. There are more unusual and exotic options that are available for bathroom floors too. From bamboo flooring to cork flooring, if you are looking for an unusual way to liven up your bathroom floors you are sure to find it. There is even cushion flooring available for the bathroom! Check online and in your local home improvement choices to see what all of your options are so that you can make the best decision for your budget and your bathroom! The bathroom flooring alternatives vary widely depending upon your budget and your tastes. The best bathroom flooring for you is the one that makes you proud to show off your bathroom. Choose flooring that fits your budget as well as your personal design tastes and you are sure to be happy with your choice for many years! Am re-tiling our BR floor w/ peel & stick tiles – we are empty nesters, so not worried about the floor being drowned. When complete, what is the appropriate finishing of the surfaces around the toilet base & along the tub? The original builder did nothing. You really shouldn’t have to do anything around the toilet base as I would presume you’ll be taking the toilet up to get the tile underneath the base. As far as the tub, there are protector strips that can be used — it keeps water from getting between the flooring and the tub. Some are designed to be used before you put your tile down, others afterwards. we have a pebble floor in our shower. The grout is cracking. Water sits in a 1/2″ ring around the drain for up to 13 – 14 hrs. Cld u pls advise what to do with these problems? There are grout repair fillers available to repair the cracks in the grout. Is the area that is cracked the 1/2″ ring where the water is sitting? There should be a slant to the floor towards the drain that allows this drain without sitting for 13 – 14 hours. If it is the grout in this area causing this, you should be able to correct that with the filler as well. Glad to know the different flooring options available that will work great in the bathroom and that are water resistant. 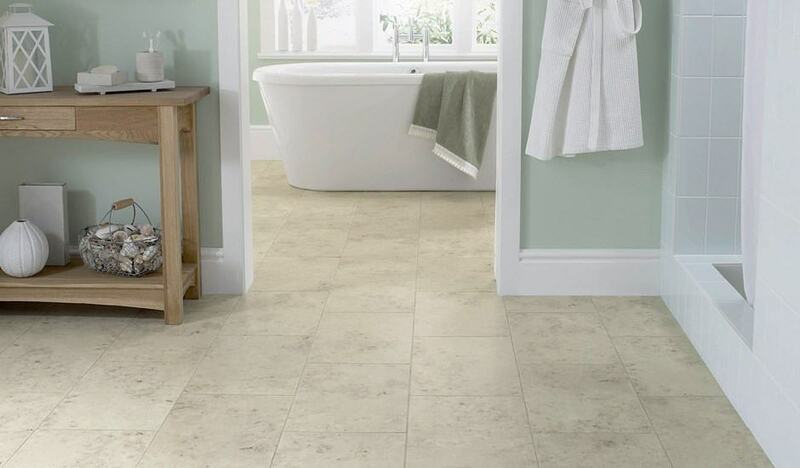 It will be easier to choose what will be the perfect flooring that will really suit to the bathroom.